While visiting my cousin Julie Mae in seattle we went to this gastropub in Capitol Hill called Quinn’s. 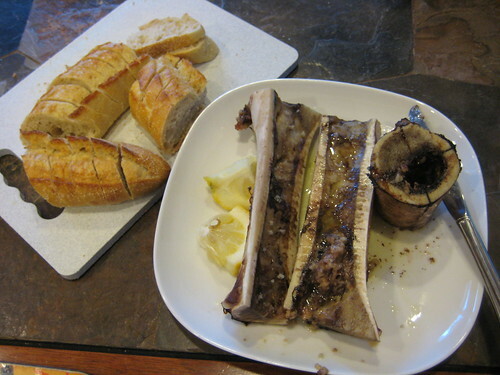 I was inspired by their amazing roasted bone marrow that they had so I recreated it at home for the family. It was incredibly easy, albeit the bone marrow was hard to find, I am going to try checking out the filipino seafood city, as bone marrow is most common in asian markets. I ended up at whole foods, I had to ask the butchers for it, and they cut it for me length wise. The bone marrow itself is very cheap, and even at wholefoods it cost me $3.50 for the three pieces I bought. I roasted the marrow for about 15 minutes in the oven at 450 degrees, then sprinkling the top with fleur de sel and lemon juice to add some acidity to it. It was servied with sliced sourdough. I learned a few lessons from this, I will next time clean the bone more throughly for a better presentation. I want to buy a fig jam for it as well, maybe it’ll have a sweet and savory side.